mushroom pulav recipe - simple, easy and delicious recipe of mushroom pulao made in pressure cooker. rinse 1 heaped cup basmati rice very well in water till the water runs clear of starch. then soak the rice in enough water for 30 minutes. after 30 minutes, drain all the water from the rice and keep aside. in a mortar-pestle, crush 3 to 4 garlic cloves + 1 inch ginger + 1 green chili and keep aside. also rinse, wipe dry and chop/slice the mushrooms. heat 2 tablespoons oil in a pressure cooker. add all the whole spices mentioned above and saute till they crackle and turn fragrant. then add 1 large onion, which has been thinly sliced. stir often and saute the onions till they start becoming golden. then add the crushed ginger+garlic+green chilies paste. saute till the raw aroma of ginger and garlic goes away. then add the chopped or sliced mushrooms. saute the mushrooms for 4 to 5 minutes on a low to medium flame. then add the rice. season with salt. mix the rice grains gently with the rest of the ingredients. add 1 teaspoon lemon juice. then add 1.75 cups water. for an aldente texture in the rice, add 1.5 cups water. check the taste of the water and it should taste a bit salty. if not, then add a bit more salt. cover and pressure cook mushroom pulav on medium flame for 7 to 8 minutes or 2 to 3 whistles. when the pressure falls down in the cooker naturally, then open the lid. add 2 tablespoons chopped coriander leaves. gently fluff and mix. 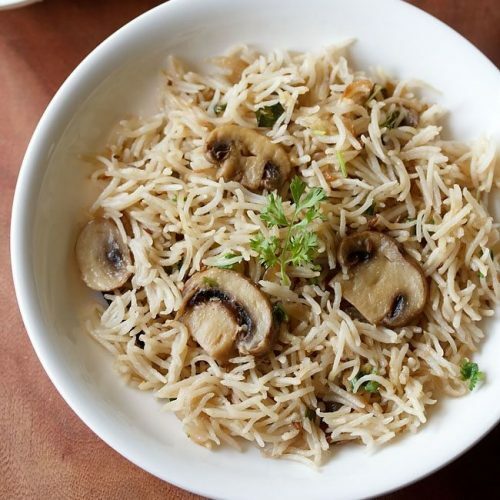 serve mushroom pulav hot with pickle, raita or salad. follow all the cooking steps in a thick bottomed deep pan or pot. add 1.75 to 2 cups water. on a low flame, simmer and cook covered till all the water is absorbed and the rice is done.